Research has conclusively demonstrated that retirement savings portability dramatically reduces 401(k) cashout leakage, preserves retirement savings and reduces the incidence of missing participants. With that in mind, it’s not surprising that recent retirement public policy activities are increasingly focused on various aspects of portability. As we look forward, the most important portability development on the horizon is the DOL’s auto portability Advisory Opinion, which will provide guidance for plan sponsors on the automatic roll-in of small account balances previously forced-out into safe harbor IRAs. On June 19th, the ERISA Advisory Council convened to address issues associated with lifetime income (LTI) solutions within defined contribution plans. For these solutions to be practical, participants must have a means to consolidate prior-employer plan balances, since on average, they will change jobs 10 times over the course of a 40-year career. The Plan Sponsor Council of America (PSCA), an organization that in the past has taken a principled position on consolidation, gave testimony proposing a curious solution -- forcing out all terminated participants with balances less than $20,000 into safe harbor IRAs. This approach would benefit plan sponsors by purging more terminated participants from plan rolls and delivering more cost-efficiency. Unfortunately, exiling more 401(k) savers to safe harbor IRAs does nothing to improve their retirement outcomes, preserve their retirement savings or help them keep track of their savings. The PSCA’s recommendation significantly ups the ante on two legislative proposals – the Retirement Plan Modernization Act and the Retirement Savings Lost and Found Act – which advocate increasing the force-out threshold to $7,600 (with future indexing to inflation) and $6,000, respectively. To deliver benefits to participants and to the defined contribution system, any solution that increases the force-out threshold should be paired with auto portability, as participants’ retirement savings can be easily re-integrated into the defined contribution system as they change jobs. On June 20th, the Employee Benefits Research Institute (EBRI) provided an hour-long webinar on the EBRI Retirement Security Projection Model® (RSPM), sometimes referred to as the EBRI “super model”. The findings from the EBRI RSPM model once again demonstrate that auto portability is a vitally important retirement savings public policy initiative, with quantifiable benefits that rival those of other major policy proposals. The EBRI RSPM model reveals that auto portability’s greatest impact would be for younger age cohorts with 20 years or more of plan eligibility. For example, in the population 35-39 years of age, auto portability would reduce the Retirement Savings Shortfall (RSS) by a whopping 23%. For this cohort, auto portability’s benefits are second only to the universal defined contribution scenario (28%) and equivalent to those derived from programs that significantly expand defined contribution plan access. On June 25th, the American Benefits Council took the lead role in sending a letter (link) to DOL Assistant Secretary Preston Rutledge on the topic of unresponsive and missing participants. Other signatories to the letter included an alphabet soup of industry advocacy groups, including the ACLI, CIEBA, ERIC, ICI, PSCA, SHRM, SIFMA, SPARK and the U.S. Chamber of Commerce. This communication follows an October 2nd, 2017 letter from the Council that urged the DOL to act on the problem of missing participants and acknowledged that the missing participant problem originates from the combination of a mobile workforce and a lack of retirement savings portability. The latest letter reiterates many of the Council’s specific recommendations for improving plan sponsor guidance for locating missing participants in ongoing plans. It suggests coordinated action between the DOL, IRS and PBGC, points to the “context-dependent” nature of missing participants, and requests that attention be given to the ongoing issue of inconsistent enforcement. Meanwhile, this summer the DOL is believed to be putting the finishing touches on their auto portability Advisory Opinion. The pending Advisory Opinion, when finalized, will represent the single most important action to be taken to create the preconditions necessary for widespread adoption of auto portability. It will provide guidance to plan sponsors allowing the automatic roll-in of small account balances that were previously forced-out into safe harbor IRAs, without the need to seek affirmative participant consent. 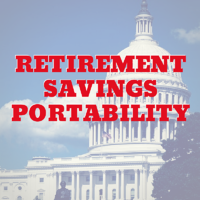 Auto portability represents the nexus of true retirement savings portability and, as forecast by EBRI, will be a winning public policy initiative, significantly reducing cashout leakage and enabling a comfortable and timely retirement for millions of Americans.